Isla Espiritu Santo, off the coast of La Paz in Baja, features some of the most beautiful beaches in the world coupled with unique wildlife experiences. A snorkeling-friendly colony of sea lions and a nearby population of plankton-eating whale sharks make Espiritu Santo an extraordinary destination for kayakers and wildlife enthusiasts alike. Join us on this spectacular island, and fall in love with Baja's startling beauty. ROW Sea Kayak Adventures' newest Baja kayaking trip blends fun-filled days of sea kayaking in the tranquil waters surrounding Isla Espirito Santo, a National Park and UNESCO Biosphere located just north of La Paz, Baja. The island features numerous deep coves with beautiful white sand beaches hidden between sienna-hued headlands jutting out of turquoise waves. The island hosts spectacular beaches that were voted by the Travel Magazine as some of the most beautiful beaches in the world. Espiritu Santo (Holy Spirit) Island is uninhabited unless you count pelicans, parrot fish and dolphins. One of the trip highlights is snorkeling with friendly sea lions at Los Islotes, volcanic islets where playful sea lion pups dive off the rocks and pirouette below you. Other activities include hiking up colorful arroyos studded with tall cactus, snorkeling amongst hundreds of tropical fish, paddling below fantastic rock formations, and enjoying margaritas on the beach as the sun sets. Our motorized support boat carries all camping gear and the makings for fabulous meals prepared by your guides with a Mexican flair. Your kayaks are light and easy to paddle between camps while the accompanying motorboat provides an additional level of safety. ADD A DAY TO SNORKEL WITH WHALE SHARKS: Don't miss out on the opportunity to snorkel with these gentle giants during your trip to La Paz. This day tour is specifically designed to add on to either end of your kayaking trip and is the perfect complement to your vacation experience. La Paz is one of the few places in the World where you will have the opportunity to observe, interact and learn about these docile fish. A local whale shark guide accompanies you on your swim. Their knowledge and passion for whale sharks are obvious as they work to make your time swimming in La Paz educative, meaningful, and memorable. Arrival in La Paz. Check into hotel of choice (not included in trip cost). You're on your own for sightseeing or shopping until eve pre-trip meeting in the hotel lobby of the Seven Crown Centro Hotel, where we'll answer questions and let you know the meeting time for the next day. Dinner is on your own, and we highly recommend a stroll at sunset along the waterfront malecon walkway. There are a variety of restaurants with ocean views, or look up our local restaurant guide for details. You'll board a boat for our shuttle to Espiritu Santo island. Upon arrival to the beach, your guides will teach you the basics of paddling and thoroughly review safety procedures. You won't leave shore until all participants feel comfortable in the boats, and then you will kayak to the first night's campsite. Our motorized support boat carries all the heavy gear, food and water so your kayaks are light and easy to paddle. After a final breakfast, you'll take a short motorboat ride to visit the friendly sea lions at Los Islotes. This colony is accustomed to people snorkeling among them, and curious pups are often eager to interact with people. After getting your fill of whiskers and flippers, the panga will drive you back to La Paz and your hotel (not included in trip cost). You're invited this evening to join your group and guides for an optional, farewell dinner at a delicious local restaurant (not included in trip cost). Recount your tales and toast your new friends before relaxing into a real bed. Extend your stay in La Paz a day before or after your kayak tour for a chance to snorkel with whale sharks. (We recommend adding this before your trip for an easier transition into your adventure in Baja. These plankton-eaters are the world's largest fish, and can reach lengths of up to 42' (13 m)! Whale sharks migrate into the bay of La Paz from October through April, where the shallow water of the bay harbors the favorite treats of these filter-feeding animals. Meet your guides bright and early to get a head start on the water in search of these peaceful creatures. The tour is approximately four hours, depending on the number of whale sharks present, so you'll have time to spend the afternoon exploring La Paz's beautiful Malecon. Visit the hotel cafe or a local restaurant for breakfast before your departure. Depending on your flight arrangements, you may have time for a morning promenade on the malecon of La Paz bay to say your farewells to Baja. If you're flying via San Jose del Cabo, ensure that you have adequate time in your itinerary to shuttle from La Paz to Cabo. 2019 - 2020 Dates Coming soon! La Paz offers some unusual highlights, such as swimming with playful sea lion pups and the chance to see Whale Sharks (harmless plankton eaters, and the largest fish on the planet!). Espiritu Santo is stunningly beautiful, with deep coves of turquoise water surrounded by white sand beaches and burnt sienna colored volcanic cliffs. 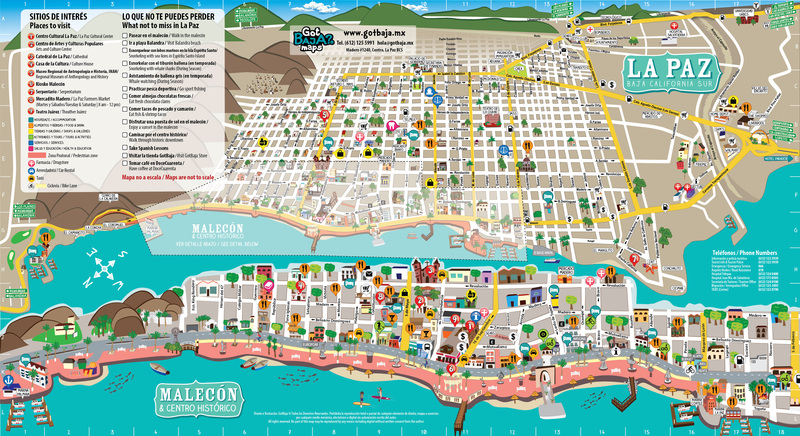 Additionally, because La Paz is only a couple hours from Los Cabos (via a shuttle service from the airport), the city is easily accessible by air. You can also fly directly to La Paz. In general, fishing in allowed in La Paz. You would need to obtain a fishing license either before arriving or upon arrival. Our guides will not allow fishing if you are unable to produce a valid license. You will also need to bring all of your own fishing equipment. Along our kayaking routes there are areas where fishing is allowed, the guides will let you know where fishing is prohibited. Also, fishing is only allowed at the guide's discretion, as we have an itinerary, schedule and other group members that we have to take into consideration. To keep our group size small and our impact minimal, we typically limit our tours to 14 people or less. Our standard minimum to confirm a departure is 4 guests for our Espiritu Santo kayak tour. If you will be extending your stay in lovely LaPaz before or after your tour, consider joining us for a day to snorkel with Whale Sharks. La Paz is home to a unique and prolific Whale Shark population. Don't miss the adrenaline rush of snorkeling with these gentle giants, while simultaneously learning about this unique species. Please inquire with the office if you would like to add on a Whale Shark tour to your reservation.